Successfully Added Android 5.1 Car DVD Player - GPS, Quad Core CPU, 8 Inch Touch Screen, CAN BUS, VW + Skoda Cars to your Shopping Cart. This 2 DIN car stereo benefits from a quad core 1.6GHZ processor 1GB of RAM and 16GB of internal storage. 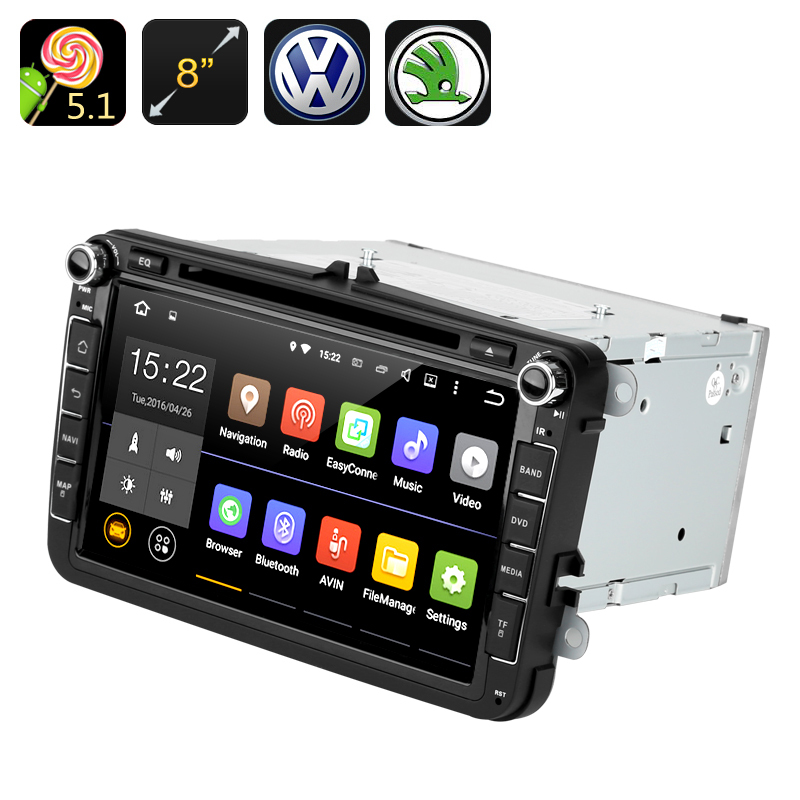 Designed to fit most vehicles this car DVR with CAN-Bus decoder (for VW + Skoda cars) is a superb way to upgrade your cars media capabilities and enjoy easy navigation with the Android GPS support. With the Android 5.1 operating system comes OK Google Voice controls, so you can interact with this stereo without ever taking your hands off the wheel. ask for weather updates, set route changes, and control the media all from with voice prompts. You can pair up your Smartphone to enjoy hands free calls : dial, hang up, send messages and more. Thanks to the optimized memory management of the Android 5.1 operating system you can enjoy an unprecedented performance letting you enjoy your favorite playlists, browse the web, navigate and play games so it provides ampler entertainment for you and your passengers. With its 8 inch 1024x600 screen you have a large display to aid in navigating and that will display media in great resolutions. With right and left video display outputs you can hook this in car entertainment system up to headrest monitors making it easier for those in the back to enjoy movies or games and offering a sure fire way to keep the kids entertained. The region free DVD player brings great compatibility so no matter where you purchased your DVDs they will play faultlessly on this sunning media car media center. For Wireless data connectivity on the go you can rely on the 3G dongle support and get WDCMA data services for downloading content and apps direct to the stereo. A precision porcelain antenna brings fantastic accuracy to the GPS allowing you pin point precision on Android maps and ensuring you will never be lost again. With a 3D GUI and fast refresh and tracking speeds you will be guided to your destination letting you sit back and enjoy the ride. The Android 5.1 Car Stereo comes with a 12 months warranty, brought to you by the leader in electronic devices as well as wholesale Car Stereos..